When Everelle finds herself fleeing her burning world with no memory of her past, she joins seven strangers escaping the inferno. Is this truly her only hope . . . to follow the mysterious Mentula, a man who unerringly leades them to a strange, different world up a cavernous wall? Why were they chosen to come to Isle of Foote? Who believed these eight strangers could save this mysterious island above Mother Eaarth? While struggling to answer such simple questions as "What's your name? Where are you frome? 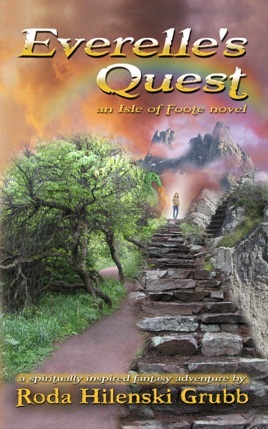 ", Everelle is persuaded to join the other seven on a quest to rescue Isle of Foote from certain implosion. Joining forces with unlikely characters like dragons, wizards, giants and more, she and her new comrades face their own inadequacies, doubts and fears as they seek the answers to the mystery laid out before them. Everelle's Quest is alive with creative imagery and action. It has elements of faith and creation mixed with charming fantasy. There is an overall sense of goodness prevailing over all evil. There is a sense of wonder of parallel, other worlds. This is a good tale for all who believe that we are here for a reason and enjoy being reminded of that overall quest for the meaning of life. . . .Dr. Nedra Kinerk, Ed.D.